Just went through a giant box o' stuff. Found some drawings I made around 1992, age 16/17. 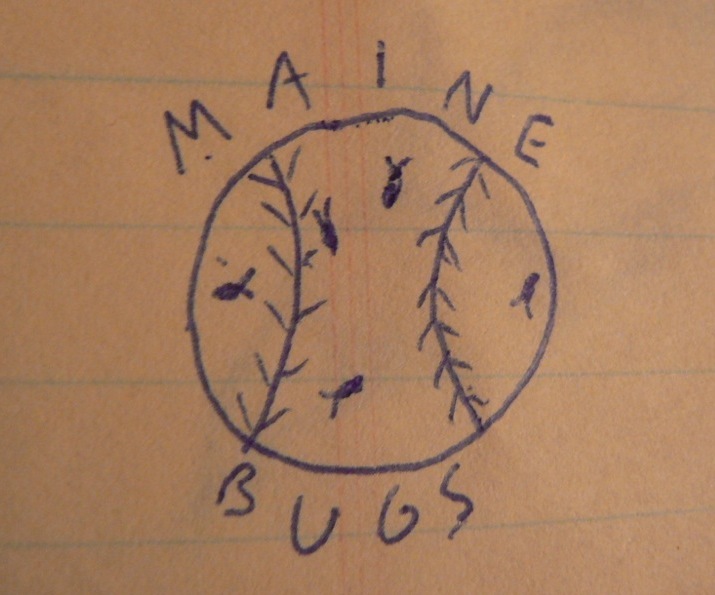 Logos for baseball teams in the "New England Division" of a league I invented with a team in each state. I'm pretty sure this was a logo-only league, meaning no actual games were played (however that would have been accomplished). So here we go, in alphabetical order. Look for your state! 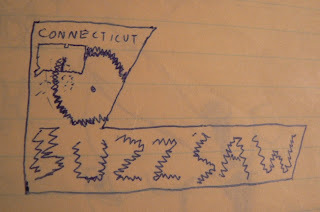 Connecticut Buzzsaw! My home state representin' with a non-S plural name, as was the trend for new teams in the early 90s. 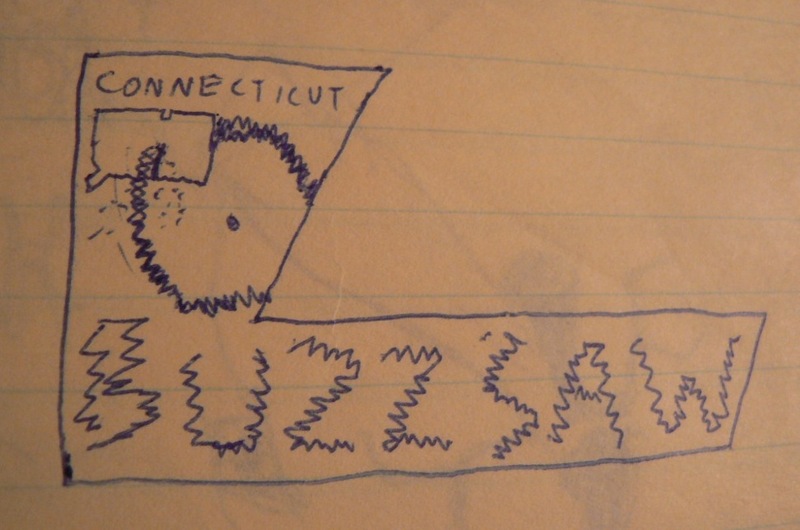 Not sure why that shape is used--maybe to make the saw blade look like a C. Also note that as a Connecti-Q-tian, I correctly included the little notches on the state map. 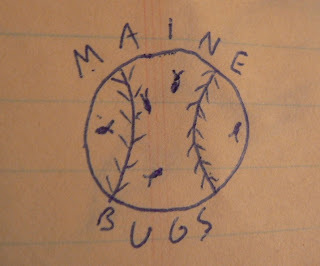 Maine Bugs! This one seemed like a throwaway--yet it was on the bottom of the page, with a few on the next page, meaning it was hardly the last one I drew. Like the Buzzsaw (and all the others), I see no actual connection between state and nickname. Massachusetts Pizza! That's right, I couldn't spell Massachusetts. I still have trouble with that one, honestly. And I obviously thought the word would go nicely over the top of the plate, but ended up having it go way to the right instead of starting over. Check out the paper plate. 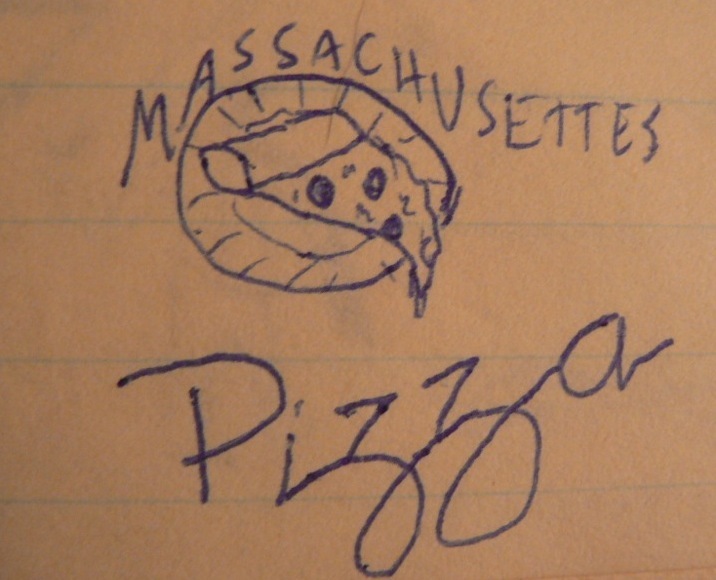 And the pizzeria-style rendering of "Pizza." After having lived in Mass, I now know this team should have been called the Pizza Subs. New Hampshire Slime Buckets! Okay, New Hampshire people, including my cousins, calm down. I'm quite positive I just did this because having a team called the Slime Buckets and then drawing the actual buckets would be funny. I could have used it for any state. 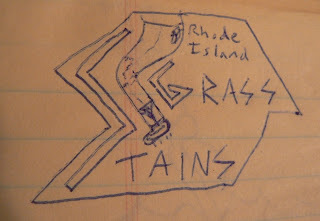 Rhode Island Grass Stains! As a current Rhode Islander, I am quite proud of the gritty bunch that is "the 'Stains." Batting glove in the pocket, stirrups on the ankles, and green on the knees. 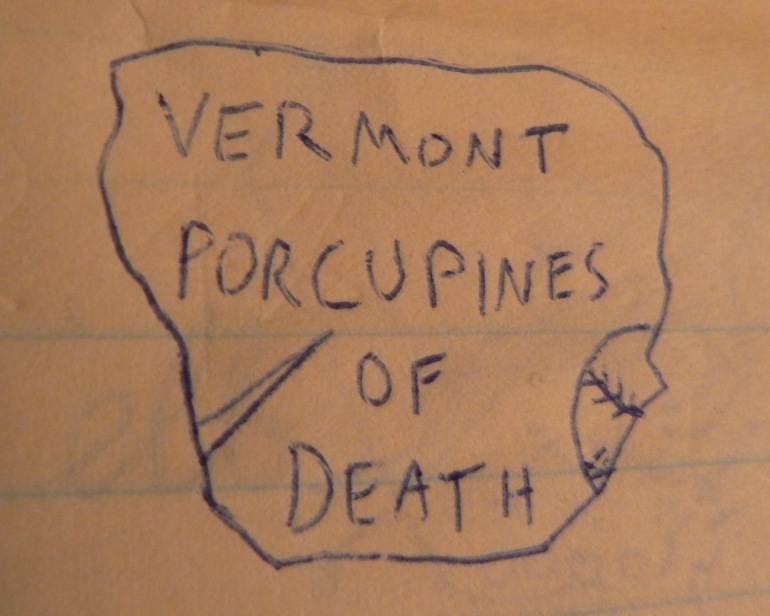 Vermont Porcupines of Death! Ooh, artsy. 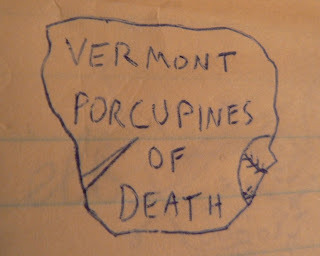 Or, it was the last one and I wasn't about to attempt to draw a porcupine. 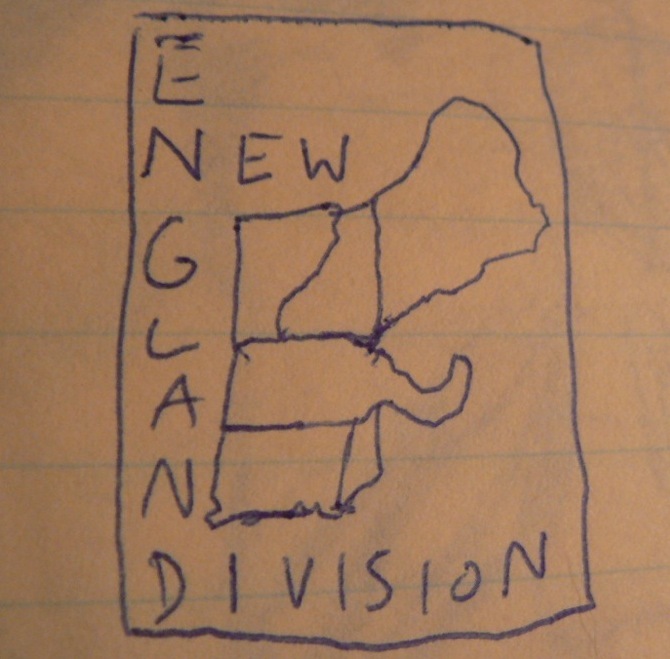 Also, this, RI, and CT all have the logo inside a weird shape. Ew, what is that thing? Haha, those are outstanding. Bonus: I didn't know about that CT notch...you learn something new every day apparently. Brilliant stuff. I love it. Did you ever get round to creating unis too? Thanks! 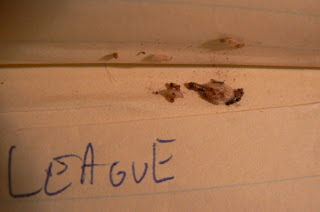 No, this one was definitely more of an off-the-cuff thing, as opposed to other leagues I made when younger that actually played games and stuff. 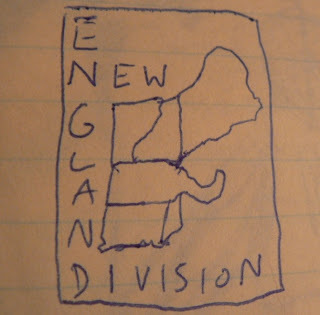 But I did divide the nation into divisions and wrote out which states were in which one. Beyond that, though, what you see here is it. 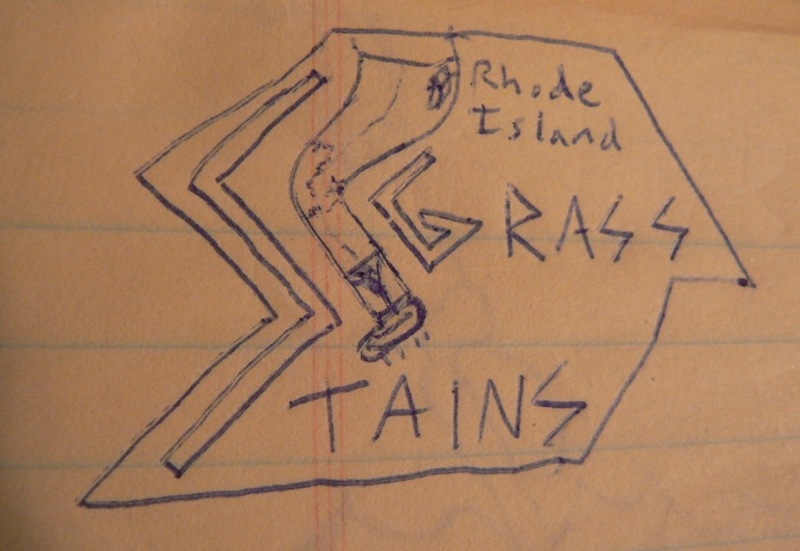 I would love to borrow that RI Grass Stains picture. I absolutely love it. Thanks. You can e-borrow it any time. I will proudly back the Slime Buckets, even though our team will be made fun of the most with a name like that.